There are three slides in Mary Meeker’s Internet Trends 2014 that tell a good story of where video is going. The first slide shows mobile (smartphone & tablet) shipments compared to TV units. 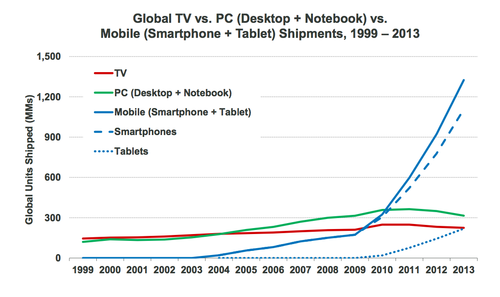 TV shipments are flatlining just under 300M whereas mobile & tablets are skyrocketing to nearly 1,5BN per year. 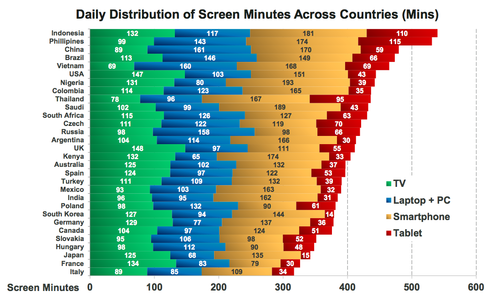 The second relevant slide shows the daily distribution of screen minutes. In nearly all countries, smartphone & tablets are eating up half or more than the daily screen minutes consumed. 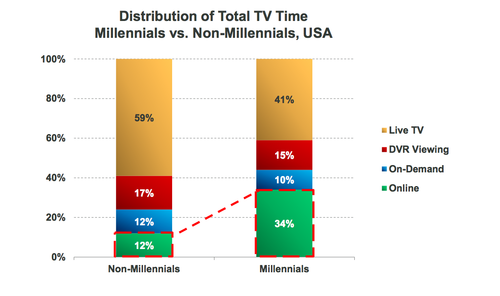 The third, and probably most relevant, shows the distribution of total TV time for millennials vs. non-millennials. Almost half of the TV viewing for millennials is done on-demand or on-line. Five times more devices shipped per year than TVs, taking half of the daily screen consumption minutes and half of the TV viewing minutes for millennials. Mobile is eating the TV, hindered only by the lack of mainstream LTE availability. But it’s getting there, faster than any of us expected it.